Amazon leads this list of market-thumping stock returns since 2012. The stock market has made respectable gains of nearly 70% over the past five years. Yet investors could have done much better than that if they were lucky enough to buy (and hold) individual stocks with unusually strong growth profiles. You wouldn't have had to pick especially risky investments like small-capitalization companies or biotech start-ups to beat the S&P 500, either. Instead, many well-known stocks generated fantastic returns for patient investors. 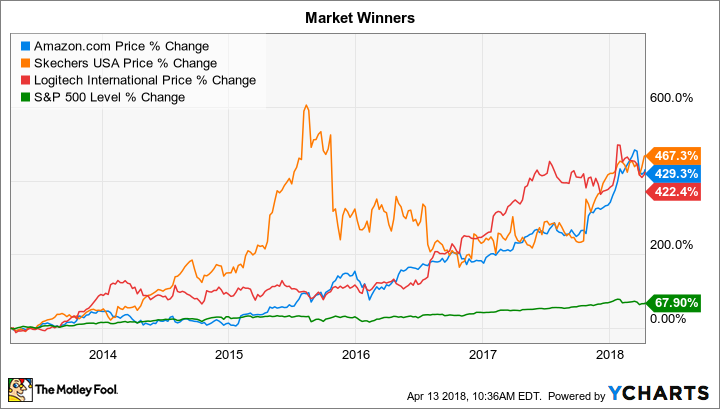 Below we'll look at three companies -- Amazon.com (NASDAQ:AMZN), Logitech (NASDAQ:LOGI), and Skechers USA (NYSE:SKX) -- that grew by at least 400% over that period. Five years ago, e-commerce sales accounted for less than 6% of the broader retailing world, according to government statistics. Today, that figure stands above 9%, and that seemingly small spike translated into a rough doubling of the digital sales pie. E-commerce has shot up to over 9% of retailing from less than 1% in 2000. Data source: Federal Reserve Economic Data. Market leader Amazon has been by far the biggest beneficiary of this tectonic shift in retail. Its product sales passed $118 billion in 2017, up from $52 billion in 2012. Yet investors have been even more pleased with Amazon's improving profit position. Its surging sales base, in addition to profits from its cloud services division, helped it generate $3 billion of net income over the past 12 months and $2.3 billion in the prior year. In contrast, it posted a modest net loss in 2012. With enviable market positions in two major growth industries, it's understandable why investors are so optimistic about this founder-led company that's managed to hold on to a start-up mentality even as it passes $700 billion in market capitalization. Computer peripherals specialist Logitech faced major challenges to its business back in 2012 and 2013. Consumer demand for PCs was plunging, and that shift threatened core product lines like keyboards, pointing devices, and speakers. In fact, revenue dropped in 2012 and fell again the following year as profits slumped. The company's subsequent recovery has been a case study in the power of operating and design flexibility, at least when those actions come from a business with a strong brand and a long track record for innovative product design. Thanks to new releases in high-growth areas like home speakers and video gaming, Logitech recently notched a 22% sales spike over the holiday quarter. That marked the company's best growth pace in seven years. And, with help from cost cuts spurred by its sales slump in 2013, cash flow set a quarterly record as well. The rally in Skechers' stock can be pinned on the footwear specialist's success at standing out in a crowded global marketplace. The company owns the top walking, work, and casual dress footwear brands in the U.S. Yet some of its best gains lately have come from its international segment, whose growth powered a 27% sales spike in the most recent quarter. Skechers' $4 billion of revenue in 2017 was nearly three times the $1.5 billion it generated five years ago. Profit growth hasn't been quite as impressive, but the company still managed $383 million of operating income last year, compared to just $22 million in 2012. Executives said in early February that this growth was "a testament to the worldwide strength and relevance of our product, marketing, and brand." Investors are hoping those assets will deliver additional market-thumping gains when Skechers kicks off its new fiscal year by reporting earnings results on April 19. No one knows which stocks will trounce the market over the next five years, but I'd pick Amazon to outperform among this group. Its success is less dependent on innovation, after all, and it's tied to an e-commerce niche that still has a bright outlook for growth as it approaches 10% of the broader retailing industry.